The round-shaped ramekin measures 8 cm in diameter. It is perfect to delight guests by serving them individual portions. The dark-blue ramekin is excellent for mini cakes or special gratins. The premium ceramic evenly disperses heat during baking to produce perfect results. The cookware's smooth surfaces are easy to clean. With a ramekin from Staub's Ceramics range, you can prepare your culinary creations and serve them in style. The STAUB brand has its origins in France – more precisely in Alsace, a region world-famous for its culinary artistry and good food. The product range focuses on cast-iron and ceramic cookware for consumers who seek the authentic and emotional experience of cooking and taste. 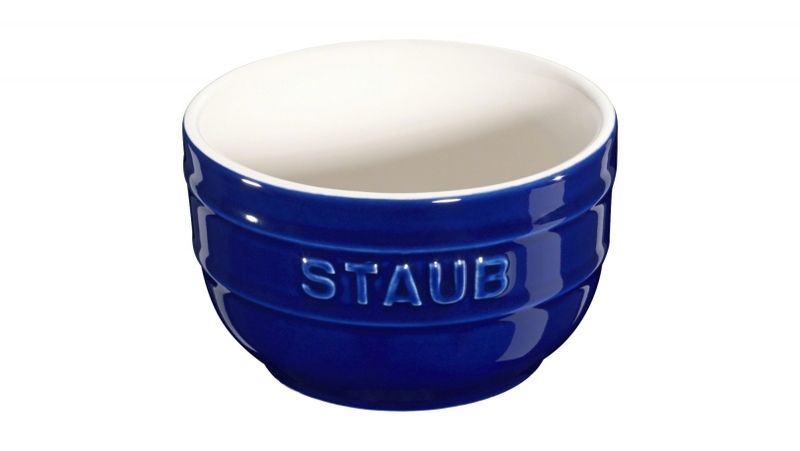 STAUB products perfectly combine traditional craftsmanship and state-of-the-art technology. Renowned restaurateurs the world over have come to appreciate the high quality of the products, which explains why they are not just used in the kitchens of prestigious restaurants. Even amateur cooks can enjoy the benefits of preparing with STAUB products and the possibility of serving food directly to the table. Delivery is free within the UK for orders above £50. The delivery cost within the UK is £4.95 for orders under £50. Deliveries are sent by DPD and typically take 2-3 working days.